In case you don't have a reservation at the grand opening of Bouchon in Beverly Hills next Monday, don't fret. 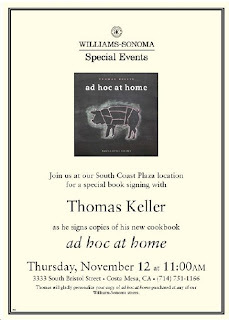 The master chef extraordinaire, Thomas Keller will be signing his book "ad hoc at home" tomorrow in the South Coast Plaza Williams-Sonoma. You can ogle at him or just tell him that his restaurant Per Se and French Laundry is not that hot. Either way, this is probably the best chance you will get to meet him up close and personal. I doubt it as I think I'll be in the office while this is going on. I think ChoiSauce is going. Have fun! wish I could go =( Have you been to Ad hoc? I so wanted to go to Ad Hoc. Funny story, I could have gone there on the last of our SF trip if I decided to stay an extra day, I would have joined Matt and HC who did went to Ad Hoc on that Sunday. My sad sad missed opportunity. Don't fret I'll probably be going to Bouchon next week!